Protect your investment in leather furniture by keeping the material soft and supple, free of cracks, with the regular application of conditioner. When our hands get dry and the skin cracks a bit, we quickly reach for moisturizing lotion. The same logic applies to leather furniture, which often deteriorates under conditions of low humidity. 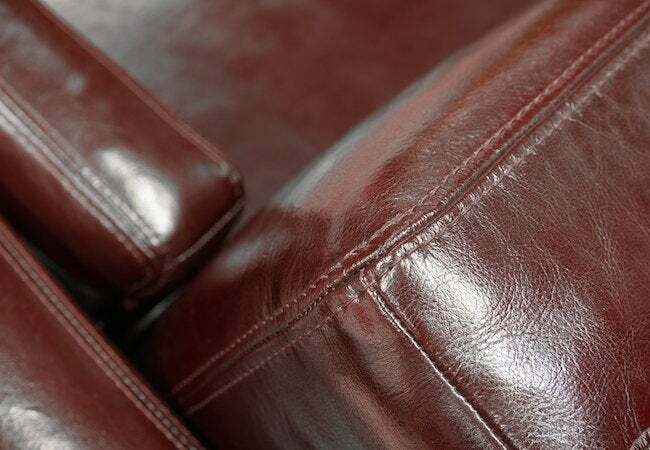 In addition to regularly cleaning your leather sofa or armchair, consider going a step further by treating the material with a leather conditioner. Doing so not only keeps the leather soft and supple, but it also goes a long way toward ensuring that the furniture lasts a long time. There are many leather conditioners on the market, but you can make your own with nothing more than a few common pantry staples. Read on for more information on each type of homemade leather conditioner, and remember: As with any leather care treatment, it’s important to test your conditioner in an inconspicuous spot before you commit to using it on the entire piece of furniture. Only proceed if you’re happy with the results of the conditioner in the test area. When it comes to homemade leather conditioner, most soaps are poor choices. Natural baby soap is an exception. Just be sure to choose one that includes no potential stain-causing color additives. Mix one quart of warm water, one tablespoon of soap, and a couple drops of vinegar. Dip a cloth into the mixture, wringing it out so it’s damp and not wet. Wipe down the entire surface of the leather furniture piece. Allow the leather to air-dry once finished. Combine beeswax, cocoa butter, and sweet almond oil in a saucepan, using a 1-1-2 ratio. Apply medium heat, being very careful not to overheat. As soon as the solid fats have melted into the oil, remove the pan and allow the mixture to cool. After 30 or 40 minutes, you should have a thick balm. Apply the balm directly to the leather with your fingers, gently massaging in the conditioner, wiping away any excess. Once finished, buff the leather with a dry cloth to make it shine. Oil-based conditioners are a controversial topic in leather care. While many homemade leather conditioner recipes involve the combination of olive oil and vinegar, some experts warn that olive oil can cause damage over time. What do those experts recommend instead? Lemon essential oil. Though the liquid has the desired conditioning qualities, it’s comparatively safer to use. To use lemon essential oil as a leather conditioner, dampen a soft, clean cloth with 10 to 15 drops of lemon essential oil, then massage the leather surface with the cloth. Not only does the oil leave behind a fresh scent, but it also works to prevents cracks and promote the longevity of the leather piece.